If you’re an iPhone user based in Europe, you’re going to have greater control over data roaming when iOS 8 makes its public debut this fall. Apple has added the ability to toggle Internet connectivity specifically alongside the general data roaming switch in its latest iOS 8 beta. Seeded to developers on Monday, iOS 8 beta 4 contains a whole bunch of minor tweaks and improvements, including a new Tips app, a redesigned Control Center, and real-time dictation. And there’s one new feature that’s specifically for iPhone users in Europe. 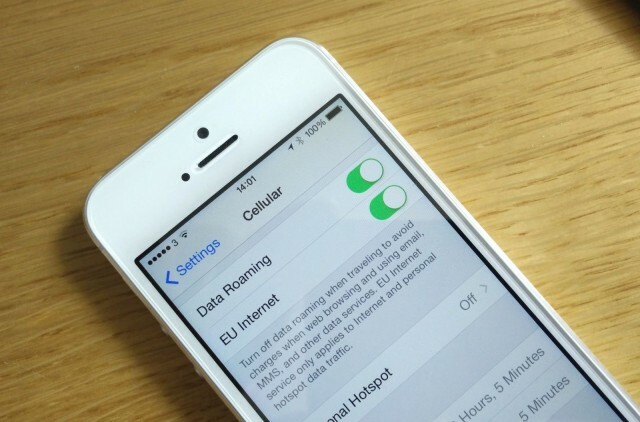 Inside cellular settings, Apple has added a dedicated “EU Internet” switch alongside the existing data roaming toggle. It gives users the ability to active Internet connectivity when they visit countries inside the European Union, while in other parts of the world in will remain inactive. Presumably, this change follows new European legislation that says carriers can no longer charge customers for data roaming when they visit other EU countries. The rules don’t officially come into effect until 2015, but a number of carriers have already begun abolishing roaming fees. The new settings inside iOS 8 are a little confusing, however, because you cannot active EU Internet without first activating data roaming, which kind of defeats the object of the new feature. Presumably Apple will change this, but in the meantime you can active data roaming, then active EU Internet, and then deactivate data roaming again.